District 1 candidate Consuelo Martinez discusses her stance on city issues, with Rick Paul to the right, John Masson on the left and Chad Hunziker on the far left. 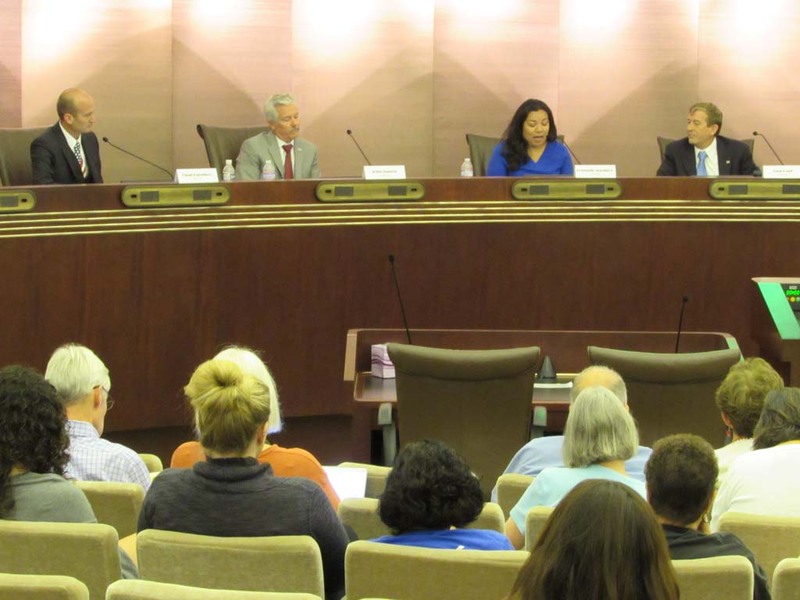 ESCONDIDO—District 1 and 2 Council candidates took part in a forum Wednesday morning to discuss their stances on budget issues and ballot initiatives. This will be the first election in which voters will choose among their districts. Voters in District 1 can only vote for a candidate in that district. Councilman John Masson called the districting divisive. “The challenge is, you have to keep your constituents happy if you want to remain in office, to get things done for all of Escondido,” said Masson. This is Masson’s first time running, since he was appointed to his position by city council in 2012. Candidates who are running against him in District 2 agreed with the districting. “I agree with the districting. We should be working as a whole city together,” said Nicole Downey. “We’re all very passionate about the city. Just because we have districts now, I don’t think that’s going to change,” said Rick Paul. Consuelo Martinez, who is a candidate in District 1 also agreed with the re-districting. “The city government should reflect the community that it’s in and I think districts are one way of doing that,” said Martinez. The open space initiative was also discussed, which is a controversial initiative voters will decide on in November. Developer Michael Schlesinger hopes to overturn the permanent open-space designation of the Escondido Golf Course to develop more than 400 homes and community facilities. Paul said he was running as the “open space candidate,” and is staunchly against Prop H because he believes the golf course was part of the city’s Master Plan and there is no reason to change it now. Martinez supports the initiative because she wants to save the city millions of dollars in legal fees, which it’s facing now because Schlesinger is suing the city for making his property worthless. Chad Hunziker, who is running in District 2, also supports Prop H, because he said constituents are excited about the swimming pool and community facilities the developer promised to include. Current council members Ed Gallo and Masson don’t support the initiative. Gallo said a promise was made to the residents on the golf course when it was built 50 years ago and city council needs to keep that promise. Nicole Downey supports Prop H because she believes the city can’t take Schlesinger’s land without giving him anything in return. Another ballot measure that will be coming up in November is the decision for the city to become a charter city, Prop G.
The two current councilmembers think the city should make the switch to a charter city and all the other candidates oppose it, with the exception of Rick Paul and Hunziker. Gallo supports the move to a charter city. “We’re the only city in North County that is not a charter city,” said Gallo. He blamed cities going bankrupt on bad fiscal policy and said becoming a charter city will not risk the city’s financial stability. Hunziker said he is tired of unfunded mandates coming down from the state and believes the move to a charter city will give more power to the local government. Masson also supports the city becoming a charter city. The other candidates were against it. “Becoming a charter is risky, expensive and unnecessary. It gives politicians more power to raise taxes,” said Downey. Martinez was also against it, she said, because the voters did not approve it two years ago and she doesn’t believe it needs to be on the ballot again. Voters in District 1 will decide between Martinez and incumbent Gallo. District 2 voters will choose between incumbent Masson, Hunziker, Downey and Paul. Update: A previous edition stated Chad Hunziker was in support of Prop G, the move to a charter city. He does not support it but says that it could be beneficial. Also, it was stated that Escondido re-districted the city. Re-districting is something that happens annually according to population growth, while districting of the city was a one time change dividing the city into voting districts.